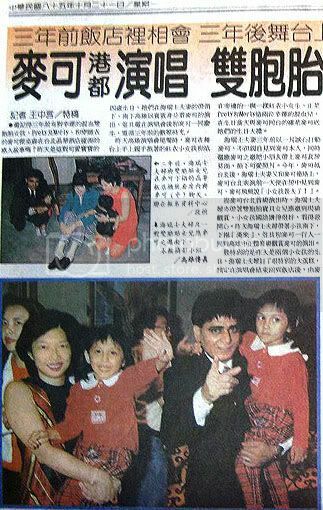 Remember the moving story of lucky twins Prety and Morlys' meeting with the King of Pop in his pyjama's at the Taipei Grand Formosa Hotel room 3 years ago? Ma and her husband touched Michael with their sincerity 3 years ago, not only had they met Michael in his private hotel room, he also invited their twin babies to meet him. The couple gave Michael a wooden caved leopard artwork as a thank you gift for his kindness, ever since then, they had built up the friendship by keeping in touch. Michael has never forgotten them, he even invited them on holiday in the U.S, but because the twins were so little at the time, and due to Mrs. Ma's husband's busy work schedule they were not able to make the trip. The lovely twins are mixture of Indian and Chinese. They had an early birthday present from Michael by joining him on stage in his Kaohsiung concert yesterday. The most special moment has to be that Michael personally celebrated the twins' 4th birthday in his hotel room after the concert, as they had previously arranged. The couple were said to be overwhelmed by Michael's kindness toward their family, which made the twins the envy of all the MJ fans in the country!